In 'Thank You For Your Service,' The Fight Begins After Iraq Based on a book by journalist David Finkel, the new film examines the challenges of three young men who return from military combat to their families and a crumbling VA. In the film adaptation of Thank You For Your Service, U.S. soldiers Adam Schumann (Miles Teller), Solo Aeiti (Beulah Koale) and Will Waller (Joe Cole) struggle to return to civilian life. 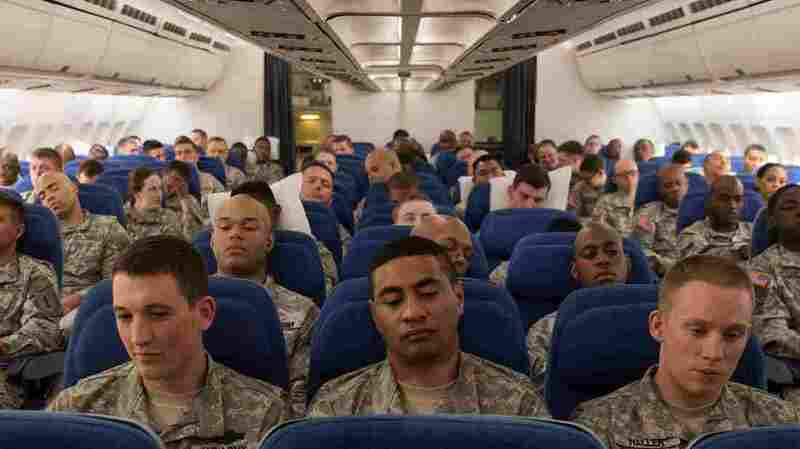 The new movie Thank Your For Your Service is about coming home. Specifically, it's about American soldiers who come home after serving during the "surge" in Iraq in 2007. One scene takes place in a therapist's office. Sgt. Adam Schumann and his wife Saskia need help, and the therapist starts listing Schumann's military honors. "You never told me about those," Saskia says. Saskia is the one who insists Schumann get help. The real-life Adam Schumann says, yes she did. "She's a firecracker, yea," he says. "Even though she's my ex-wife I owe a lot to her, for her looking at me when I came home, and poking me, and going, 'What the f*** is wrong with you?'" Schumann did three deployments in Iraq. He led a battalion during the surge. He lost friends. He came home traumatized and plagued with guilt. The movie is based on the non-fiction book of the same name by Pulitzer-Prize-winning journalist David Finkel, who covered the war in Iraq for The Washington Post. He spent several months embedded with Schumann's battalion. "And by every measure of what a soldier should be, [Schumann] was a great soldier," Finkel says. In April 2007, Schumann and a group of his soldiers were on a dangerous operation in a village where bombs had been coming from. While they were on the roof of a building, one of his men — Michael Emory — was shot in the head by a sniper. Finkel says Schumann carried Emory — a big guy — down the stairs on his back. "Emory was bleeding out of his head, and Adam had him on his back, and just because of the angle of things, the blood coming out of Emory's head kept flowing into Adam's mouth as he was gulping for air," he says. "So that was April. When I met and began reporting seriously on Adam six months later, that was October. He was about to come home. One of the problems is that he could not stop tasting Emory's blood." It was one of the many episodes that haunted Schumann long after he left Iraq. And at the same time he's carrying the burden of those memories, he's also trying to adjust to life back in the U.S. with his wife and two small children. Thank You For Your Service was written and directed by Jason Hall, the Oscar-nominated screenwriter of American Sniper. "In previous wars these guys came home on slow ships, and it was two months with these guys in the hold talking about their experiences and sort of processing this journey that they'd gone through in war," Hall says. "And now they'll be in the sandbox one day, next day they're cooking pancakes for their family. It's a real quick turnaround." Adam Schumann experienced that shock. He came very close to taking his own life. "They take your gun," he says. "They take your uniform — everything you had. And you're left with a couple of medals, some pieces of paper and some photographs. "And you do feel alone and then you start isolating because you miss these moments with your buddies and your camaraderie. It can be severely lonely in your own mind – [it] is probably the worst place you can be." The movie reflects the reality many vets face when seeking help from the Department of Veterans Affairs: packed waiting rooms and long wait times to see a therapist. As Schumann puts it in the movie: "This s*** could give me PTSD." Director Jason Hall knows these stories might not be fun to watch. But he believes it's important to understand what day-to-day life is like for a lot of Iraqi vets. "Until we can understand what we're asking them to do and what we've put them through, we're still going to keep sending them off," Hall says. Meanwhile, Adam Schumann says he and his buddies depicted in the film are doing well. For a while Schumann worked as a peer counselor at the same rehab center where he was treated for PTSD. "I kind of felt like a squad leader again, you know?" he says. "I had my own room down in the basement. And the guys knew I was there. And they would just come down, knock on the door, and just chat. And one of the guys, he texts me everyday: 'I love you Adam.' I text him back: 'I love you too.' So just that little — I know he's there for me and he knows I'm there for him no matter what. So it's great." Schumann was very involved in the making of Thank You For Your Service. He has a cameo. And when the filmmakers heard him singing an old marching cadence he learned in basic training, they got Bruce Springsteen to turn it into the movie's theme song. Schumann sings backup.